Salmon and other fatty fish such as sardines and mackerel are the superstars of heart-healthy foods. That’s because they contain copious amounts of omega-3 fatty acids, shown in studies to lower the risk of arrhythmia (irregular heart beat) and atherosclerosis (plaque build-up in the arteries) and decrease triglycerides. The American Heart Association recommends eating fish and preferably fatty fish at least twice a week. Omega-3 fatty acids are also available as dietary supplements. Oatmeal is high in soluble fiber, which can lower cholesterol. “It acts as a sponge in the digestive tract and soaks up the cholesterol so it is eliminated from the body and not absorbed into the bloodstream,” says Lauren Graf, a registered dietician and co-director of the Cardiac Wellness Program at Montefiore Medical Center in New York City. Graf recommends avoiding instant oatmeal, which often contains sugar, and heading instead for old-fashioned or even quick-cooking oats. Other whole grains such as bread, pasta and grits are also good for the heart as long as they still contain the entire grain. Several studies have now shown that dark chocolate may benefit your heart, including one in 2012 that found that daily chocolate consumption could reduce nonfatal heart attacks and stroke in people at high risk for these problems. The findings applied only to dark chocolate, meaning chocolate made up of at least 60-70% cocoa. Dark chocolate contains flavonoids called polyphenols, which may help blood pressure, clotting, and inflammation. Unfortunately, milk chocolate and most candy bars don’t make the grade when it comes to protecting your heart. Women who consume high amounts of the flavonoids found in oranges and grapefruits have a 19% lower risk of ischemic stroke (caused by a clot) than women who don’t get as much of these compounds, a recent study found. Citrus fruits are also high in vitamin C, which has been linked with a lower risk of heart disease. Beware of citrus juices that contain added sugar. And be aware that grapefruit products may interfere with the action of the cholesterol-lowering drugs known as statins. Soy products, including tofu and soy milk, are a good way to add protein to your diet without unhealthy fats and cholesterol. Soy products contain high levels of polyunsaturated fats (good for your health), fiber, vitamins, and minerals. What’s more, soy may reduce blood pressure in people who eat a diet high in refined carbohydrates. And compared with milk or other proteins, soy protein can actually decrease LDL or “bad” cholesterol. Tomato consumption in the U.S. has been rising and that’s a good thing. Like potatoes, tomatoes are high in heart-healthy potassium. Plus, they’re a good source of the antioxidant lycopene. Lycopene is a carotenoid that may help get rid of “bad” cholesterol, keep blood vessels open, and lower heart attack risk. And because they’re low in calories and low in sugar, they don’t detract from an already-healthy diet. “They’re excellent for the body in a number of ways,” says Graf. 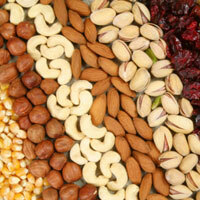 This includes almonds, walnuts, pistachios, peanuts and macadamia nuts, all of which contain good-for-your-heart fiber. They also contain vitamin E, which helps lower bad cholesterol. And some, like walnuts, are high in omega-3 fatty acids. “Some people in the past have avoided nuts because they’re higher in fat, but most of the studies show that people who consume nuts daily are leaner than people who don’t,” says Graf. And leaner people are at a lower risk for heart problems. Look for varieties that don’t have a lot of added salt. In a landmark study, people at high risk for heart disease who followed the Mediterranean diet (high in grains, fruits, vegetables) supplemented by nuts and at least four tablespoons a day of olive oil reduced their risk of heart attacks, strokes, and dying by 30%. Olive oil is a good source of monounsaturated fats, which can help reduce both cholesterol and blood sugar levels. Olives themselves—both green and black—are another source of “good” fat, says Graf. And they “add a lot of flavor to salads,” she notes. Long a favorite in Asia, green tea has grown more popular in the West and may bring with it significant health benefits. One recent study found that people who drank four or more cups of green tea daily had a 20% reduced risk of cardiovascular disease and stroke compared with people who “seldom” imbibed the beverage. The findings echo a previous study that found lower rates of death, including death from heart disease, among avid drinkers of green tea. Antioxidants known as catechins may be responsible for the effect. When it comes to your health, you really can’t go wrong with vegetables. But green vegetables may give an extra boost to your heart. These are high in carotenoids, which act as antioxidants and free your body of potentially harmful compounds. They’re also high in fiber and contain tons of vitamins and minerals. 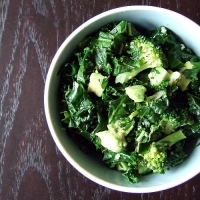 Kale also has some omega-3 fatty acids. “Green vegetables are super health-promoting foods,” says Graf. Flax seeds as well as the ultra-chic (among the health conscious) chia seeds are high in omega-3 fatty acids, says Graf. That’s one reason they’re good for your heart. Another reason is their high fiber content. Plus, there are a million ways to enjoy them. Try them ground up with other heart-healthy foods, such as dried blueberries, cranberries, or oatmeal or even blended with soy milk and fruit to create a smoothie. 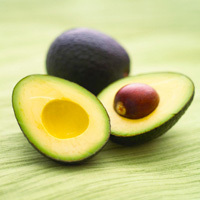 These soft, tasty fruits have a well-established reputation for providing the body and heart with healthy fats. Like olive oil, they’re rich in the monounsaturated fats that may lower heart disease risk factors, such as cholesterol. They’re also high in antioxidants and in potassium, says Graf. They can be eaten on their own or blended into guacamole, perhaps with some heart-promoting tomatoes. Pomegranates contains numerous antioxidants, including heart-promoting polyphenols and anthocyanins which may help stave off hardening of the arteries. 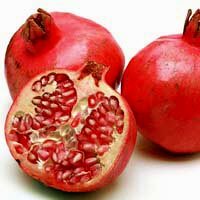 One study of heart disease patients found that a daily dose of pomegranate juice over three months showed improvements in blood flow to the heart. Ultimately, though, it’s important to have variety in your diet. If you don’t like pomegranates or can’t afford them, reach for apples, which also contain plenty of health-promoting compounds, says Graf. Cardiovascular disease affects more than 1 in 3 adults in the U.S. The good news is that some little habits can make a big difference in your ability to live a healthy lifestyle. Here are the 17 worst habits for your heart, and how to avoid them.